Brand New NSOR Accessory Dream Guide is Now Available!! The Accessory Dream Guide is Now Available!! Our glossy new magazine, The Accessory Dream Guide, is now available at all North Shore Off-Road stores. We are so excited to bring you this exclusive NSOR magazine. This is the first of its kind for North Shore Off-Road and we think you’ll love it!! It is packed full of accessory ideas and there are several vehicles featured in it as well as a BC Outdoor Adventure spread. 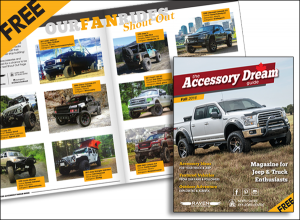 Each page featuring an accessorized truck or Jeep, called a Dream Ride, includes photos, a list of modifications and an article about the Dream Rider based on an interview he or she completed. Some of the Dream Riders are from the lower mainland so you may even see these fabulous rigs on the road someday.